After a chicken shortage led hundreds of KFC outlets to close last week, the fast food chain has now admitted it is running low on gravy. It said almost all of its 900 shops in the UK and Ireland were now open again. However, ongoing distribution problems meant some restaurants were serving a "reduced menu". A spokesman said: "We're working as hard as we can to get this sorted out. We know that our gravy is a big favourite!" The news prompted a flurry of comments on Twitter. 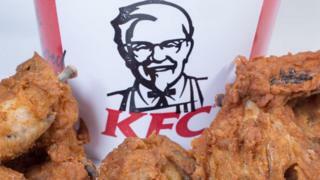 Almost 700 of KFC's UK outlets were closed last week after it decided to switch suppliers from Bidvest to DHL. At the time, DHL blamed "operational issues" at a warehouse near Rugby it was using for deliveries nationwide. The chain has apologised to customers, running a newspaper ad showing a photo of a chicken bucket with the KFC logo letters rearranged to read "FCK". The accompanying text read: "WE'RE SORRY. A chicken restaurant without any chicken. It's not ideal... Thank you for bearing with us." The GMB union criticised KFC's decision to move its contract from Bidvest, which national officer Mick Rix said was a "very well respected, specialised logistics provider", to one that lacked a track record in food distribution.